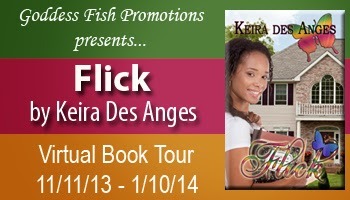 Welcome to our stop on the Flick Blog Tour hosted by Goddess Fish Promotions. Read an excerpt from this YA paranormal, an interview with author Keira Des Anges, and enter the giveaway. Enjoy! One of the fringe benefits of astral traveling is never using doors, and when Leanna walked straight through the wall into the brightly lit hallway, the hustle and bustle of the day seemed all but forgotten. Various medical personnel marched determinedly to their destinations and Leanna quickly dodged a team of doctors rushing down the corridor and the hysterical woman behind them. She moved out of habit really; even if they bumped her they’d simply melt right through. She stopped by the nearest nursing station hoping to hear news on her aunt. But to her disappointment, the staff proved useless. They were more interested in Nurse Johnson’s fling with the new anesthesiologist than discussing their charges. 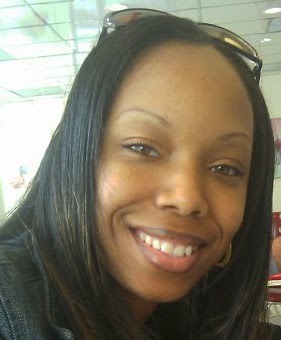 Her mother was a medical professional; Leanna knew nurses were an integral part of the medical team. But these guys were worse than an episode of Grey’s Anatomy! Eventually bored of their gossip, Leanna made her way to the opposite end of the floor. “Hey, Leanna!” Her name rang out clearly as she passed by the waiting room door. “Over here!” said the voice. Startled, Leanna turned around to peek inside. Three people sat in the small, blue waiting area. Two women whispered animatedly to one another and a stoic looking man held a magazine, although his eyes seldom moved across the page. They didn't see her, so Leanna wondered who just called. A little Indian woman, no more than four feet in stature sat in a green and purple, wing-backed armchair in the middle of the room grinning and waving madly at her. She looked no more than thirty years old and was dressed in shimmering gold from head-to-toe with a sheer, golden scarf draped over her bright, oval face and jet-black hair. Tiny glittery shoes peeked out from beneath the frock and sparkled as brightly as Dorothy’s red slippers in the Wizard of Oz. Leanna thought she even resembled a munchkin, in a cute sort of way. Like Auntie, she seemed more real than anyone else in the room and her smile grew larger as Leanna approached cautiously. “Don’t worry sweetheart, I don’t bite,” she said. The little lady patted a second green chair embossed with bright purple and orange polka dots, which mysteriously sprang out of nowhere, and Leanna sat down. “Waiting for me? Why? Who are you?” Leanna asked, not quite sure she should be talking to her in the first place. “Remember?” Leanna asked now thoroughly confused. “I’m sorry, what are you talking about? We’ve never met before,” she said apologetically. “Oh Leanna, trust when I say I have been with you all of your earthly life, before and beyond,” the lady corrected. “Until now you haven’t seen me because it wasn’t time. But I have been with you as promised and kept watch over you. Which, I might add, has been quite a task considering your little adventures,” she said smiling again, taking some of the sting from her words. Leanna frowned, studying the peculiar, little lady in the shiny clothes. She didn’t know why or how, but she did look vaguely familiar, like she might’ve seen her around; possibly in a dream. Somehow, Leanna sensed there was more to the story than that. 1. If you could be any character, from any literary work, who would you choose to be? Why? I’m going to choose a recent literary work and say Peeta Mellark from the Hunger Games series by Suzanne Collins. He is strong, loyal, kind-hearted and brave. In an otherwise dark story, he struck me as the eternal ray of light, a physical manifestation of hope and good in the world. 2. What is the first curse word that comes to mind? How often and why do you use it? I don’t curse. I can think of a ton of other worlds to use. 3. How would you spend ten thousand bucks? If someone gave me ten thousand dollars, I would prefer to save it. BUT, if I had to spend it I would take a nice family European vacation, first class the whole way. 4. What are 5 things within touching distance? 5. Do you have a crush on anyone? Well it’s not a crush actually, but I whole-heartedly enjoy Jim Parsons portrayal of Sheldon Cooper. I’m not much of a TV watcher, but I look forward to seeing him every night. Can’t. That one little word stops so many people from reaching their true potential. Summer. I hate, hate, hate the snow unless I am bundled up in a house in front of a fire and don’t have anywhere else to go. I went to college at the University of Buffalo. It was a great school, but the snow was ridiculous. After I graduated, I decided I would move to move to Florida one day and here I am! One randomly chosen commenter will win a $50 Amazon/BN.com gift card. Follow the tour and comment; the better your chances of winning! The tour dates can be found here. Nice interview. I'm with you, I like the summer. I hate the cold.